Last year, I picked up a SJ C code lid, a 22" lid, an ash pan, legs, triangle and wheels from a CL add listing them as free. The person who placed the add hits a lot of garage sales in the Oakland area. I asked him to keep my phone number and call me if he came across some other Weber items as I might be interested. 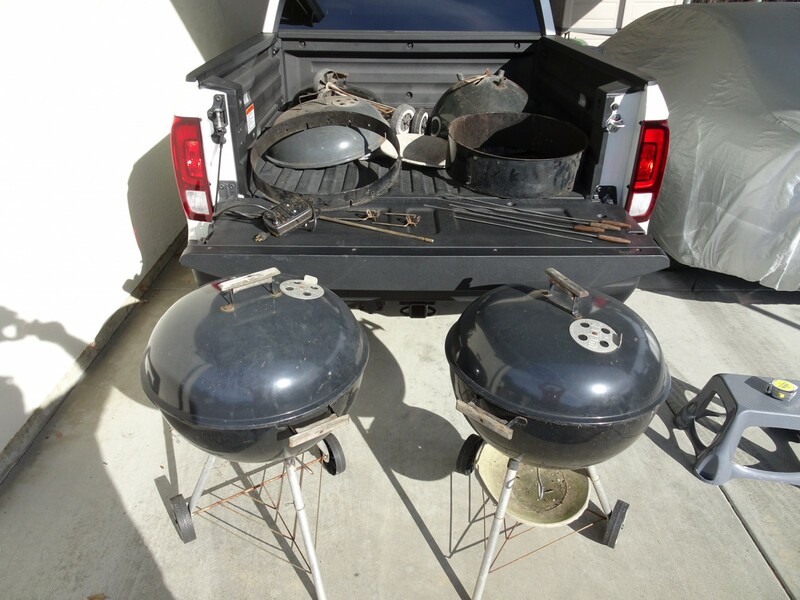 While I was out of town a few weeks ago at the rented beach house, I received a text from the guy saying he had some more Weber "stuff" if I was interested. I responded I was and would get back to him. Well, being distracted restoring the Ambassador and trying to make contact with the owner of the Plainsman in the wild, I totally forgot about his offer. I reached out to him this past weekend and we met at his house on Sunday. Everything in the bed of my truck he gave to me for free. He had obtained them from friends that were cleaning out their dad's garage. Their father had passed and they had no interest in his BBQ stuff. The two complete kettles were dropped off by a friend Sunday night. Her sister wanted to "get rid of them" and she knew I might be able to re-purpose them. The sad part is the vintage rotisserie and shish kabob set were in their original boxes. Unfortunately, he left them sitting out in his yard and were exposed to the rains last week. The boxes were toast. Wow! You're tearing it up. Wow, a kabob ring and roti, that's quite a haul. Congrats. I guess it never hurts to make friends while you're out kettle hunting! Awesome score! And thanks for sharing the story!! PLEASE bring back Online Finds to the app!!!!! Why don't this chit happen to ME?! Nice bro! !